Membership organization that provides global access to knowledge, research, and best treatment practice for eating disorders through advocacy and outreach, a newsletter and academic journal, webinars, conferences, and Twitter chats. Published the Nine Truths about Eating Disorders in 30 different languages. Florida-based advocate for early intervention for all eating disorders, providing workshops and presentations, support groups, a national toll-free help line, and referrals. Free newsletter. A directory of Internet-based virtual eating disorder support groups listing name, location, meeting times, treatment setting (public or closed group), audience age and gender, therapist credentials, and cost (if any). Coalition of organizations and treatment centers focused on advocacy for federally funded research through outreach to members of Congress. Website includes background information, information on insurance and mental health parity, news updates, and an open forum for research questions. Helpful, fun-filled exercises and resources about food, healthy eating, and body image for pre-teens. Created and maintained by Illinois ED therapist Abigail Natenshon. Membership organization dedicated to empowering families through conferences, member task forces, their Internet forum Around the Dinner Table, an online store; other online resources include member articles, an extensive curated list of links with blogs from caregivers, patients, and professionals, a YouTube channel, patient audio interviews, and book reviews. IJED’s mission is to advance the scientific knowledge needed for understanding, treating, and preventing eating disorders. The journal achieves its mission by publishing rigorously evaluated, high-quality manuscripts for distribution through print and electronic platforms to an international readership of health professionals, scientists, and advocates. Abstracts are available for each article. Some articles are open; others need to be purchased or accessed through academic databases. Free confidential web-based support group for pregnant women and moms with eating disorders that meets on the third Sunday each month from 6-7 pm CST. An introduction to the family-centered treatment method that includes articles, videos, frequently asked questions, family stories, book reviews, list of treatment providers, and tips for working with professional team members. 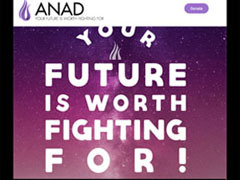 Founded by a Chicago-area nurse in the 1970s who began the first national hotline and referral service, ANAD's advocacy and support services now include Grocery Buddy, Recovery Mentorship, and a YouTube Recovery Channel. The largest national advocacy organization publishes Making Connections Magazine, sponsors national conferences, NEDA walks. The website includes referrals, insurance resources, downloadable brochures, a volunteer care navigator program, resource articles, a blog, online forum, and Google Hangout chats. Parent-created website with informational video for parents caring for a child with anorexia, includes links and tips for parents. 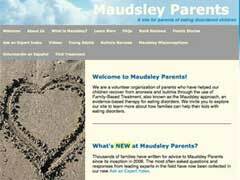 One of the oldest parent-created sites providing resources, information, online forum and support features. Audience: Caregivers. Advocacy site created and maintained by Illinois ED Therapist Abigail Natenshon with separate collections of resources and activities for patients, parents, and professionals. Dr. Kelly Flanagan, a licensed clinical psychologist and happy father of three, writes letters to his young daughter to help teach her about the world. But everyone can benefit from reading his wisdom. Here's what he had to say about the fashion industry. To help support SMEDA, be sure to log in to Amazon Smile before making your Amazon purchases. Links open an Amazon search unless otherwise noted. by Jeanne Albronda Heaton & Claudia J. Strauss. 2005. When a friend or family member shows signs of an eating disorder, the first impulse is to charge in, give advice, and fix what is wrong. But these tactics--however well-intentioned--can backfire. This compassionate guide offers ways to tackle the tough topics of body image, media messages, physical touch, diets, and exercise-along with a special section on talking about these issues with children. It includes information about when to get professional help, how to handle emergencies, and answers to difficult questions such as "Am I too fat?" or "Is this ok to eat?" by Ellen Astrachan-Fletcher and Michael Maslar. 2009. At the root of bulimia is a need to feel in control. While purging is a strategy for controlling weight, bingeing is an attempt to calm depression, stress, shame, and even boredom. This book offers new and healthy ways to overcome the distressing feelings and negative body-image beliefs that keep you trapped in this cycle: four key skill sets-mindfulness, distress tolerance, emotion regulation, and interpersonal effectiveness-and begin using them right away to manage bulimic urges. The book includes worksheets and exercises. The author discusses her Montreux Clinic's commitment to treat the most severe cases, defying the belief that eating disorders are incurable. She describes the treatment of her own two daughters. Myths and misconceptions have shaped conventional treatment of anorexia and bulimia, leading to a cycle of hopelessness for those who suffer. Claude-Pierre's work reveals that victims share a common feeling of self-contempt. Further, she asserts that these overwhelming feelings of worthlessness are established at birth and slowly erode the healthy self. The book describes five stages of recovery, discusses the challenges peculiar to working with them at home, and presents a plan for working with health professionals. For parents of a child with an eating disorder, the most crucial question is "What do we do now?" 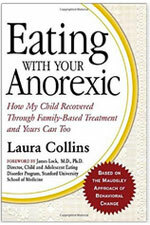 In this poignant, informative book, Laura Collins shares how she and her husband discovered the answer for themselves--and most significantly--for their anorexic fourteen-year-old-daughter. It is a chronicle of how they applied "the Maudsley approach," a nontraditional but highly effective way to treat a disease that is well known but largely misunderstood. by Karen R. Koenig. 2005. Describes the four basic rules that "normal" eaters follow instinctively — eating when they're hungry, choosing foods that satisfy them, eating with awareness and enjoyment, and stopping when they're full or satisfied. Combines skills and techniques that promote change with a cognitive-behavioral model of transformation that targets beliefs, feelings, and behaviors about eating. Describes how to reprogram dysfunctional beliefs, manage uncomfortable feelings without turning to food, and establish new eating habits that tune their bodies into natural sensations of hunger, pleasure, satisfaction, and satiation. by James Lock & Daniel Le Grange. 2005. Eating disorder pioneers James Lock and Daniel Le Grange explain what you need to know about eating disorders, which treatments work, and why it is absolutely essential to play an active role in your teen's recovery--even though parents have often been told to take a back seat. Learn how to monitor your teen's eating and exercise, manage mealtimes, end weight-related power struggles, and partner successfully with health care providers. When families work together to get the most out of treatment and prevent relapse, eating disorders can be beat. Research, resources, and diagnostic information. by James Lock & Daniel Le Grange. 2009. A treatment manual for professionals focused specifically on adolescent bulimia nervosa based on the authors' research and clinical practice. Evidence-based strategies for helping the whole family collaborate to bring dysfunctional eating behaviors under control, while also addressing co-occurring psychological problems and parent–child relationship conflicts. by Abigail H. Natenshon. 1999. Hands-on workbook to help parents successfully intervene when they suspect their child has an eating disorder. This step-by-step guide is filled with self-tests, questions and answers, journaling and role playing exercises, and practical resources that give parents the insight they need to understand eating disorders and their treatment, recognize symptoms in their child, and work with their child toward recovery. It’s hard to decide which is more frightening--the “food” teenagers enjoy, or the things they say about their bodies. Whether it’s your son’s passion for chips and soda or your daughter’s announcement that she “feels fat,” kids’ attitude about how they look and what they should eat often seem devoid of common sense. In a world where television and school cafeterias push super-sized sandwiches while magazines feature pencil-thin models, many teens feel pressured to starve themselves and others eat way too much. Blending her experience as the mother of four with results from a survey of nearly 5,000 teens, Dr. Diane Neumark-Sztainer shows you how to respond constructively to “fat talk,” counteract negative media messages, and give your kids the straight story about nutrition and calories, the dangers of dieting, and eating right when they’re away from home. Full of examples illustrating the challenges teens face today, this upbeat and insightful book is packed with great ideas that will help kids everywhere feel better about their looks and make healthier choices about eating and exercise. Your relationship with food is a microcosm of your relationship to being alive, and to your beliefs about trust, pleasure, deprivation, and nourishment. Presents a self-help plan for breaking free from emotional eating through visualizations, guided eating and mindfulness meditations. Jenni had been in an abusive relationship with Ed for far too long. He controlled Jenni’s life, distorted her self-image, and tried to physically harm her throughout their long affair. Then, in therapy, Jenni learned to treat her eating disorder as a relationship, not a condition. By thinking of her eating disorder as a unique personality separate from her own, Jenni was able to break up with Ed once and for all. Includes practical exercises. Appropriate for both adults and teens. Sequel: Goodbye Ed, Hello Me (2009). A dietician presents her plan for successfully coping with anxiety and frustration around overeating, a perceived lack of willpower, or failing at yet another diet that was supposed to be the last one. The problem is not you, it's that dieting, with its emphasis on rules and regulations, has stopped you from listening to your body. The perfect read aloud on eating disorders for six to nine year-olds. Two mice--Billy Blue and Sally Rose--both use food in response to social pressure. One grows fat, one grows thin. Then they learn healthy ways to satisfy hunger and express emotions. by Kathryn J. Zerbe. 1995. Instead of a treatment manual, this book presents case studies that explore body image, sexual abuse, feminism, athletes, medical complications, nutrition, obesity, chemical dependency, and other factors. A parent skills manual designed to help parents assist their child with an eating disorder. Addresses skills for dealing with children at all ages. Addresses both nutritional and emotional issues, especially the role of perfectionism in eating disorders. Workbook strategies cover both care for the ED child and self-care for caregivers and other family members. Series of 30 videos created by Kelty Mental Health Resources in British Columbia. A collection of 16 videos produced by the National Eating Disorders Association featuring leading professionals such as Daniel Le Grange, James Lock, and Cynthia Bulik. The documentary can be accessed from their website in chapter segments: "Inside an Anorexic's Mind," "Family Based Treatment," "Complexity and Dangers of Anorexia," Helpful Parental Skills," "Stories," and "Hope."